JG Roofing has been meeting the roofing needs of agricultural, commercial and residential clients here in beautiful British Columbia since 1980. Friendly, professional and dependable, we offer the highest level of service in the roofing industry. 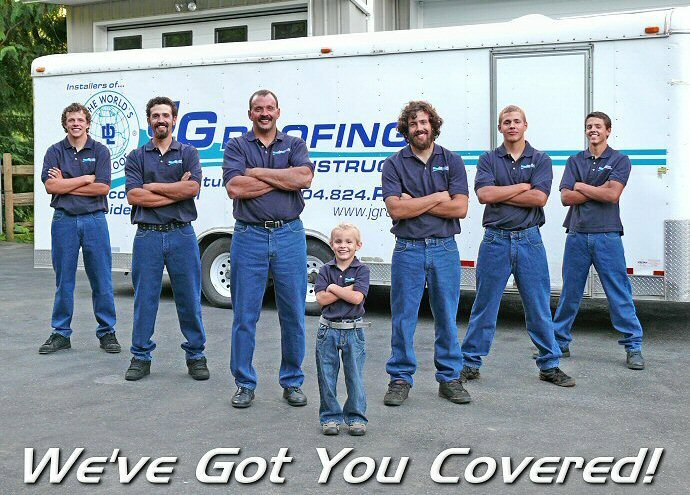 At JG Roofing, your satisfaction is the key to our continued success. Specializing in the Duro-Last Roofing System, our roofs are well designed, adaptable and stable. In fact, since receiving our factory training in 1999, we have never found a better roof nor a better warranty in the industry. Whether your roof is EPDM, Tar and Gravel, or Torch-on, we are your roofing experts, and our level of quality is second to none. Please contact us for a free quotation and let JG Roofing provide you with your total roofing solution! John Grimard, owner/operator of J.G. Roofing, has been in the roofing industry for 36 years and started JG Roofing in 1981. He has experience with all types of roofing, but now specializes in the Duro-Last roofing system because of its superior quality. "We are a family run company and our eldest son (he has nine siblings) is a journeyman roofer with four other sons in the apprenticeship program. All of our children are being trained in the industry, and they are intent in ultimately taking over and carrying on with our tradition of high-quality workmanship and top-level service." "We believe in the fair exchange of quality service for your investment. We have achieved an astonishing factory rating of 99% as Duro-Last Roofing System installers." JG Roofing has been awarded Duro-Last's highest level of certification, Elite Master Contractor, for 12 years in a row 2006-2007-2008-2009-2010-2011-2012-2013-2014-2015-2016-2017. JG Roofing has also achieved and received the Master Contractor Award 15 years in a row 2003-2004-2005-2006-2007-2008-2009-2010-2011-2012-2013-2014-2015-2016-2017. "We will continue to take care and effort to make sure every job is a job well done. Truth be known, all of us enjoy what we do for a living and generally have fun doing it. It seems ironic, but getting paid is almost a bonus!"